Capsule Wardrobe Accessories – what to do with them! Back with another episode in my capsule wardrobe journey! 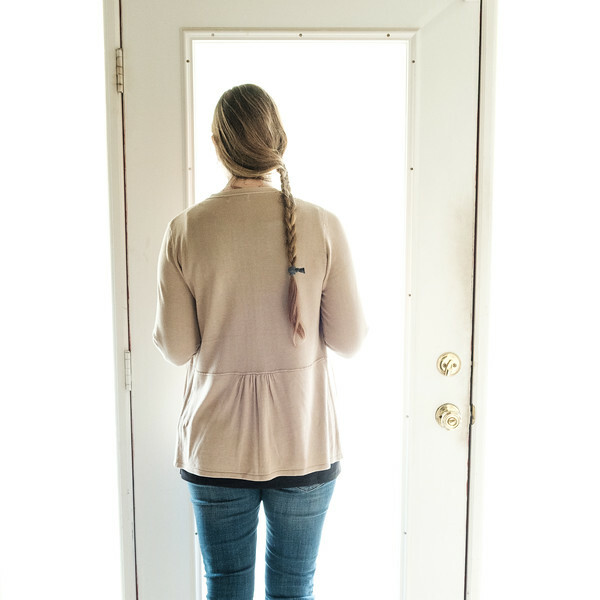 First I want to let you know that I’ve added a separate category for my capsule wardrobe posts, so it will be easy to find them any time you might want to look back at them. They are on my menu under the fashion tab, Capsule Wardrobe. Last week I talked about step one which was purging your closet. I also told you that I broke the “get it all done in one time” rule. Well, I’m about to tell you about another rule that I will be breaking. Accessories. I am using the French Minimalist Capsule Wardrobe from Classy Yet Trendy as the guidebook for my capsule wardrobe. In the accessories section there are 4 pairs of shoes, 2 purses, 2 necklaces and 1 scarf. Now, if I was young and really just starting out, I might try to actually embrace that. However, I am 59 years old. 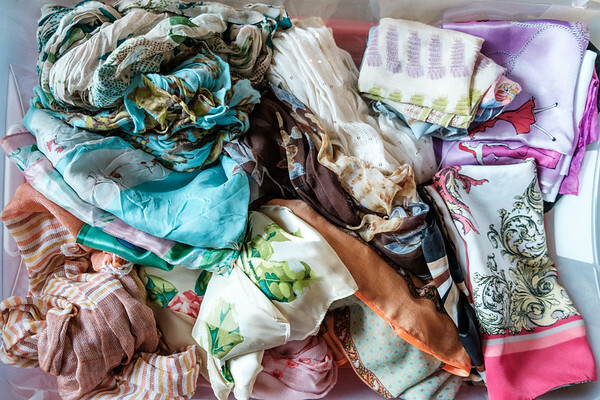 Unlike clothing, scarves and jewelry don’t wear out. What you see above is my jewelry drawer. There are necklaces that belonged to my grandmother, necklaces that I wore in college, necklaces that my daughters gave me. They aren’t going anywhere. It just doesn’t make sense to me to put these all away and wear one or two necklaces. Yes, I understand the lovely simplicity of it, but it’s just not going to happen. This is small storage tub that contain my summer scarves. They also aren’t going anywhere. Again, I embrace the simplicity of having one fabulous scarf that I wear with everything, but it’s not going to happen. I can already see that some of the scarves do not go with my color palette, so I probably won’t be wearing them, and I might move them out of this, just so that I can see at a glance scarves that go with my neutral palette. If you are looking for a picture of my shoes, it’s not here. I admit, I have a lot of shoes. They are stored in baskets on a couple of shelves in my closet. I did get rid of a ton of shoes, but I still have way more than 4! I may continue to purge them as I go along, but for right now, I’m happy with where I’m at with them. I loved this outfit! I love when style looks effortless. For this look I used a Premise cardigan from Steinmart (I love the cute detailing in the back,) black Paraphrase tank top from TJ Maxx, Lee skinny jeans, and black Jasmine slingbacks. You can get a similar look: Beige Cardigan, Black Tank Top, Skinny Jeans, Black Slingbacks, and Gold Necklace. Some of you may be balking at the thought of wearing a cardigan in the summer. I wore this for the photo and then carried it with me. We were eating out in a restaurant and I never know if the air conditioning is going to be too cold for me. It was, and I was happy to have this cute cardigan to slip on. 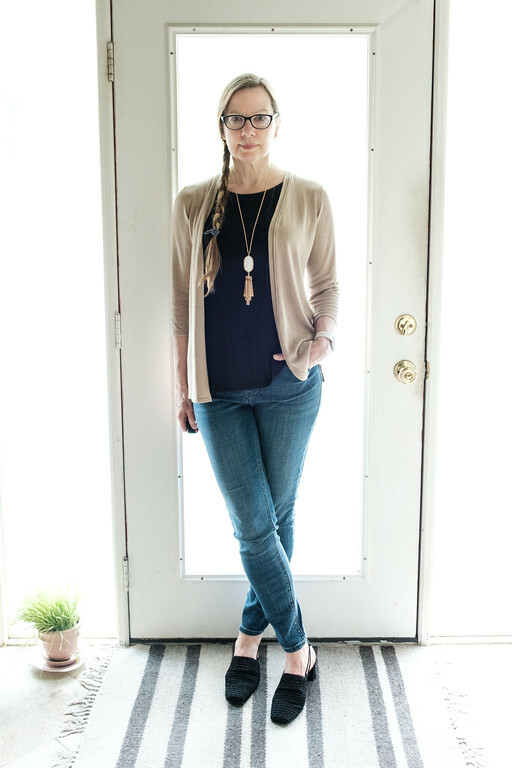 I follow the capsule wardrobe system you’re using and I’ve yet to find someone pulling it off as well as you. Please keep posting so I can steal your style! I ADORE your cardigan! Such a cute detail on the back. 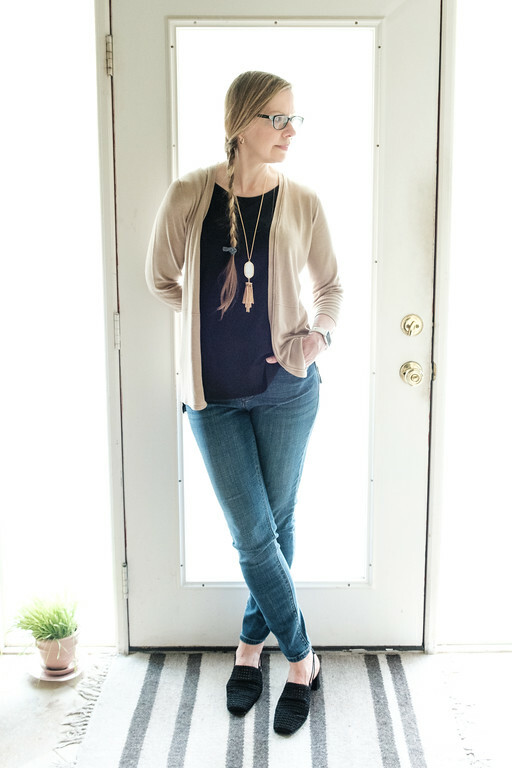 Cardigans are my constant companion every season. I either wear them or carry them with me for the air conditioned office, restaurant, or movie theater. Shoes are my issue. I tend to wear the same few pairs of earrings over and over, and I rarely wear necklaces, bracelets, or scarves (unless it’s for warmth). But shoes are my thing, and no way will I ever be able to have just a handful of shoes. And honestly, I’ll always have to have cute printed dresses. But the rest of the capsule concept is pretty great for me. I like how simply chic this outfit is. I first. Price your necklace, followed by those cute shoes and then your side braid. Funny, how my eye is drawn tonanoberall look, before I start taking in the details. I laughed when I read your statements about the jewelry. I’m with you. My Jewish not going anywhere either. 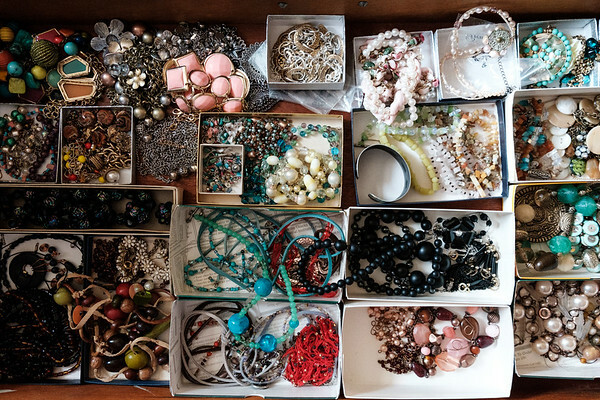 Nice way of organizing your jewelry! Thank you for linking up with Thursday Moda. What a fun way to meet friends in fashion. Nice casual look. I like the details of the cardigan in the back. Thanks for linking up to Top of the World Style.